It's been twenty-five years since Ferris Bueller took his infamous, unforgettable day off and this release of the hit comedy from John Hughes (Planes, Trains & Automobiles, Sixteen Candles) is as righteous as ever. 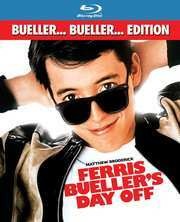 One fake sick day sends high school senior Ferris Bueller (Matthew Broderick), his girlfriend Sloane (Mia Sara) and his best friend Cameron (Alan Ruck) on the adventure of their young lives, as they ditch school and take off on a raucous journey through Chicago. They twist and shout their way all around town, while staying one step ahead of their suspicious principal and Ferris's envious sister.